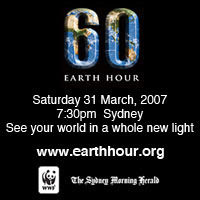 Tomorrow night in Sydney is ‘Earth Hour’: 60 minutes when tens of thousands of people and businesses turn out their lights for an hour to demonstrate their concern about climate change. Something that has surprised me is the many negative responses that I’ve heard in response to this idea. The most puzzling to me is the response that I’ve seen a number of times: “This is such a stupid idea that I’m going to go home and turn on as many lights as possible just to show them!”. Of course, it’s very easy to take pot shots at this idea. “What emissions will no lights for an hour save?”, “Sitting in the dark: that’s what the greenies want us to do permanently”, etc. At first blush, what will an hour without lights really achieve? But these critics are really just unimaginative. Good luck to the people who go home and bathe themselves in electric light as their own little protest against the stupidity of me and 50,000 other Sydney residents and businesses. I’ll be enjoying a refreshing change from my usual electricity-intensive routine and I'm looking forward to it! The Australia New Zealand Society for Ecological Economics is holding a conference on Queensland's Sunshine coast on 3 to 6 July this year, with the theme Re-inventing Sustainability: A climate for change. If you're interested in presenting a paper, abstracts are due 15 April. Ecological economics is a transidisciplinary field that looks at the connections between ecology and economics and views the economic system as a social system that operates within a broader physical / ecological system. Traditional economics certainly doesn't ignore the environment, but tends to view it as an element of the economy that provides inputs and services. If you want to know more about ecological economics, check out the International Society for Ecological Economics or the Ecological Economics Blog. I’ve been thinking about the role of government in environmental policy. And in economic, social, health and education policy. When should governments provide services? When should they regulate activities? When should they just leave things alone? There’s the environmental questions: Should they ban incandescent light gloves? Should they fund clean coal research? Should they restrict household water use? Should they impose a carbon tax or increase the price of water and let individuals decide whether to use incandescents or limit their water use and let energy companies decide whether they invest in clean coal or in renewable energy? And there’s others: To what extent should the government provide education and health and to what extent should the private sector do so? How should the government regulate smoking, alcohol and other drugs? Should the government get involved in the fast food / obesity debate? I think economic ideas can help us think about some of these issues. One of the reasons that markets tend to work effectively is that they efficiently communicate information (Should I plant wheat or grape vines? Well, how much will they cost me to grow? How much will I get for them?) and they provide incentives for people to respond to that information (planting vines will be a lot of bother, but it should make me enough in a few years to buy that car I want). The disdain that some have for governments providing services is that the information and incentives are less obvious. Should we invest more in mental health care or cancer care? Hm , hard to know. We can survey people and we can look at health stats but it’s hard to know where we’ll get more value for our money. And the people who make the decisions, while interested in the health outcomes, might also be interested in the publicity generated by opening a new cancer wing at a regional hospital. This observation is often used to suggest that things are always better left to markets than to government. But real life much more complicated than that. There are other constraints on governments. Taxpayers are acutely aware of the taxes they’re paying and proposals to reduce them will be popular and proposals to increase them unpopular. So it’s not true to say that governments don’t care about how much they spend. They have incentives to care quite a bit. Voters are also very aware of the services they’re receiving, another accountability. But these accountabilities are generally less direct than in a market. If I don’t like the service or price of my doctor’s service, I can go elsewhere. But if I don’t like the service provided by public healthcare or the taxes I pay for it, I can only exercise my one vote among thousands every three or four years and there’s generally only one other real competitor. But these problems also apply to the private sector. Economists call them agency problems. Have a think about a superannuation fund or a managed share fund, for example. When they choose to invest, they’re spending other people’s money on other people. They, not you, are making the decisions about what companies to invest in to benefit you. Where’s the incentive to make the best decision? Well, incentives are there, but again they’re indirect. After a few years of bad performance, people may start to switch funds. But this incentive is also distorted. They have an incentive not to perform much worse than anyone else – in other words, an incentive to make conservative investment decisions. Have a think about a law firm acting for you in a court case and advising you about whether to accept a compromise. What should they advise you? Again, they’re decision in how to advise you involves their assessment of how someone else’s money should be spent. And possibly creeping into that assessment is a confidence of a positive outcome that might not be there if they were spending their own money or if your money wasn’t being spent on their fees. Or think about the Board of Directors of a company deciding whether to award themselves a substantial pay rise. Here, they’re making a decision about how to spend other people’s (shareholders’) money on things that will benefit the company. Will a big pay rise for directors benefit the company? Of course, you’ll attract the best talent, the people who will boost the company’s performance, right? Again, people spending other people’s money on other people. And again, there’s incentives to do the right thing, but they’re indirect and conflict with the direct incentive to benefit themselves. (The incentives are that if they go too far, they’ll be removed by angry shareholders, and if they channel too much money that could be better spent on other things, the company will suffer, leading to pressure on them to resign and/or damaging the value of their own shares and options in the company). Or think about any manager in any large company. They’re spending the company’s money on themselves, their staff and their projects with the aim of benefiting the company. Again you can make the claim that they won’t be as careful as if it was their own money. Once again, there are incentives to spend it wisely: they want to generate good results and be seen to be doing a good job. But there are also conflicting incentives to spend it on themselves, their staff, a team retreat in the Hunter Valley, etc. Looking at who is spending whose money on whom is a useful way of looking at things and generally you’ll get the best decisions if people can spend their own money on themselves. But it doesn’t simply follow that the private sector does everything better than the public sector. A lot of private sector decisions involve how to spend other people’s money on other people too. Taken to its logical extent, this argument would suggest that all goods and services should be provided by sole traders. The baker is disciplined because she depends on her customers for her livelihood. So she’ll spend her money in ways that best benefits her customers and hence her business. But the bakery staff-member who buys the flour is spending his boss’s money on his boss’s customers: he doesn’t care too much about either. But in reality, there are other incentives on the staff member to get flour that’s good value for money. And if the baker wants to expand her business, she has to put some trust in other people. Large companies exist because the problems of people spending other people’s money is more than compensated for by economies of scale. And that’s one of the reasons that governments do things too. We could each build our own little private roads going only where we want them to go: spending our own money on ourselves. But maybe we get better value by governments doing it, even if they do sometimes decide that a marginal seat needs a brand new one to be opened at a photo opportunity just before an election. Check out futuremakers.com.au, a great new site for anyone looking for tips for a green lifestyle. The site, created by WWF (and with a lot of work from Grant Young from the Synapse Chronicles blog), is a place where people can share their ideas for living sustainably. There's some good tips there for individuals and businesses. It looks great and I like that you can add your own ideas. And you can keep updated with the Future Blog. I've also noticed an Australian green living blog, called GreenFoot, which somehow I haven't seen before, although it's been around for a while. It's another really good resource: readable, interesting and a lot prettier than my blogspot effort. And speaking of Australian environmental blogs, I really need to update my blogroll in that category. Please let me know if there's any you'd recommend. Did you know that Australians get bigger tax cuts the more they drive their cars? ( Drive your benefits further – before it’s too late! As the end of the FBT year approaches, so does the last chance for significant FBT savings on your salary packaged car. Deloitte Indirect Tax Principal Frank Klasic said that salary packaged cars remain the most popular fringe benefit provided to employees. “Although many employees successfully package their cars, there are still many who do not minimise the FBT associated with their car fringe benefit,” Mr Klasic said. According to Mr Klasic, many employees may be on the cusp of the next kilometre threshold used to calculate FBT using the statutory formula method. Where this is the case, increasing the kilometres driven can also significantly increase your savings. For example, an employee who has a car valued at $35,000 and drove 24,000km during the FBT year would have an FBT liability of $6,720. Increasing the number of kilometres driven to more than 25,000km would reduce that employee’s FBT liability to just $3,696 – a saving of more than $3,000. I assume the intent of these parts of Australian tax law is this: If car travel is a legitimate business expense, then it is reasonable for some allowance to be made for the cost of car travel when assessing tax. That’s reasonable as far as it goes, but there’s a couple of problems. First, what we’re talking about here, as I understand it, is businesses providing personal (private) cars to employees as part of their salary package* – not just employees deducting the operating costs of cars for business trips or the use of company cars owned by the company – so whether there really needs to be tax breaks for that in the first place must be questionable. Put another way, if you need to use your car for work, then fine, deduct the cost of that use from your tax. Similarly, if you use a company car for work, then your employer can deduct the cost from its tax bill. But do we really need tax breaks for businesses to provide their employees with their own private vehicles, which they may or may not use for work? (*What actually happens is that employees arrange this all themselves: they buy a car, transfer it to a lease company and lease it back, and then deduct the costs of the lease from their pre-tax incomes). The second, related, problem is that it’s hard to work out when a car is needed for business (in which case maybe it’s reasonable for an employee to provide one and for it not to be taxed) and when it’s really just being used for private purposes (in which case it shouldn’t be tax deductible). The Tax Office’s arbitrary solution is to assume that if you drive it far enough, you must have needed it for business – so the further you drive, the less tax you pay. The rate of tax you pay on your car loan repayments ranges from 26% if you drive less than 15,000 km in a year to just 7% if you drive more than 40,000km. However, Deloitte’s media release makes it pretty clear that this encourages driving more, not just for legitimate business, but also to reduce the amount of tax you have to pay, particular if you find yourself near the cusp of one of the tax brackets towards the end of the year. There’s lots of talk about new measures to discourage the use of fossil fuels and debates about carbon taxes, carbon trading, mandatory renewable targets and so on. But a good start would be simply removing the economically questionable and environmentally damaging tax breaks that exist for private cars. Green ethanol – from coal?! ( The latest trend in the green world of ethanol is a surprising one: coal. Minnesota's first coal-fired ethanol plant soon will begin operation in Heron Lake, and it won't be the last. The high price of natural gas is enticing new plant owners to embrace coal power. But while it may make economic sense, the choice of this fossil fuel to make a renewable one has some people shaking their heads. The move comes as Minnesota steps up its efforts to embrace cleaner and greener sources of energy and reduce carbon emissions. Critics say it's a lousy idea to make renewable fuel in ways that generate more greenhouse gases than using gasoline. "The country is investing in ethanol not only as a way to reduce our reliance on oil, but as a way to reduce our greenhouse emissions and our overall emissions," said David Morris, a renewable energy specialist at the Institute for Local Self-Reliance in Minneapolis. "I don't deny there is a savings for these ethanol plants using coal instead of natural gas. But at the same time, the country is providing an enormous incentive for making the ethanol in the first place," with a variety of subsidies. Until now, all of Minnesota's 16 corn-based ethanol plants were powered by natural gas, at least initially. But the soaring and unpredictable price of natural gas has everyone looking at alternatives. The most popular alternative for existing plants is generating heat with biomass, a green choice being used at plants in Little Falls, Winnebago and, soon, Benson. State regulators allow the owners of ethanol plants to choose their own power sources. Admittedly, coal "would not be our preferred alternative," said Myrna Halbach, ethanol sector manager for the Minnesota Pollution Control Agency. "We're very much behind the governor's efforts on renewable fuels," she added. "But ultimately, that's a business decision they would make." "The volatility of natural gas concerned (Heron Lake)," Halbach said. Using coal "gave them a way to control operational costs." What’s the message from this? I think one lesson may be that we need to be careful about subsidies: if you subsidise ethanol, you’ll get more ethanol. But it doesn’t necessarily follow that you’ll get lower emissions. Rather than picking and subsidising particular technologies, a better solution may be to impose a carbon tax or similar measure that places a cost on emissions from all sources. ( California Gov. Arnold Schwarzenegger and his state's Legislature have embraced a plan to rate all motor fuels by greenhouse gas emissions over their entire life cycles, from production to transportation to ignition. An across-the-board carbon tax, as I understand it, would avoid the need for these calculations. You wouldn’t need to worry about whether ethanol plants were powered by coal or by natural gas, because they would already have paid their carbon tax on the fuel they used for power: it would already be embedded in the price of the product. A former Canadian defence minister says be believes advanced technology from extraterrestrial civilizations offers the best hope to "save our planet" from the perils of climate change. Paul Hellyer, 83, is calling for a public disclosure of alien technology obtained during alleged UFO crashes -- such as the mysterious 1947 incident in Roswell, New Mexico -- because he believes alien species can provide humanity with a viable alternative to fossil fuels. Mr. Hellyer has been a public UFO advocate since September 2005 when he spoke at a symposium in Toronto. But with concern over global warming at an all-time high, and Canadian political parties struggling to out-green one another, Mr. Hellyer said governments and the military have a responsibility to "come clean on what they know" now more than ever. Mr. Hellyer, a former Liberal cabinet minister, political turncoat and one-time leadership candidate for the Liberal and Conservative parties, said UFO researchers have amassed undeniable evidence that aliens have visited our planet. Due to the distance such spacecrafts would have to travel, UFOs must be equipped with some kind of advanced fuel source or propulsion system, he said. In news more terrestrial, network Ten has a show this Sunday night at 8.30pm called Cool Aid: The national carbon test, a 2 hour "world premiere television event" that "delves into the lives of everyday Australians and audits the environmental footprint of five different household types around the country" - together with celebrity interviews and live performances. Sounds a bit wacky but will be interesting to see how Ten grapples with bringing climate change awareness to a mass-TV audience. When UFO hunters are using climate change to bring attention to their agenda and commercial networks are running two-hour Sunday night celebrity specials on the issue, you know it's become a minstream concern.